In an emergency, it's good to have a knife close by. You can use a knife for self-defense, utility purposes, cutting ropes, or preparing food. 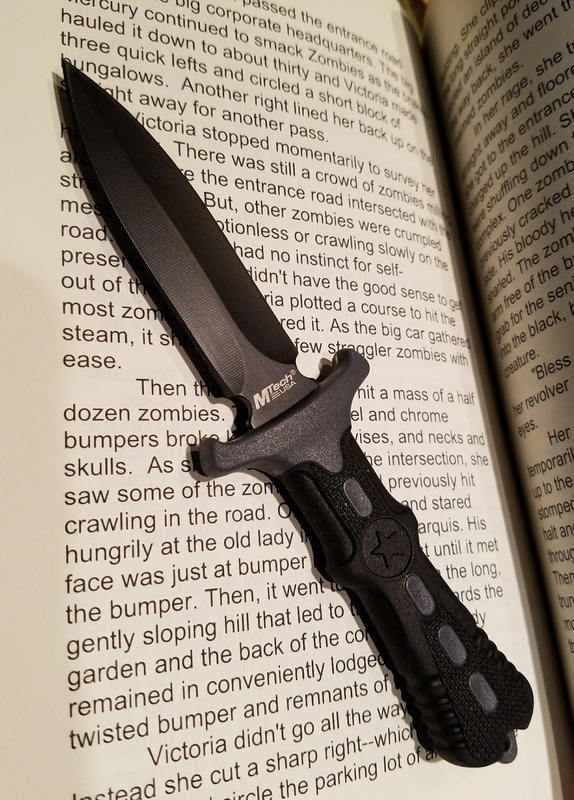 That's why I recently picked up the Mtech USA MT-20-14 Series Fixed Blade Neck Knife. At only 6 1/2-inches overall length, it's a small blade to carry concealed or stash away in a vehicle. The box from MTech contains the knife, nylon sheath, and a ball chain (like you'd use to wear a hanging badge in an office building). This is a very small fixed blade knife. The stainless steel blade is 3-inches long and the handle is 3-inches long. The sheath adds an extra half-inch. The knife can be worn around the neck and can be concealed beneath a shirt. However, it would probably show through a Tee Shirt. The blade is made of 440 stainless steel and the handle is nylon fiber injection molded. While the Amazon advertising copy says that the lanyard loop on the handle could be used as a glass breaker, it is made of hard molded nylon not metal. This knife sells for less than $10 online. At that price, it's a good value for the money. 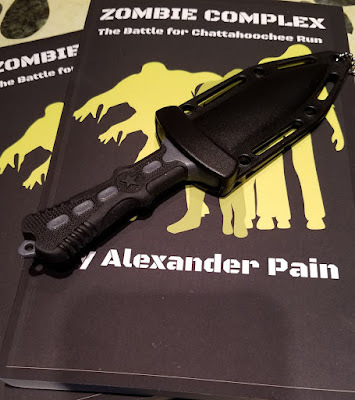 I'm not sure that a knife this small would be useful against zombies. It doesn't have the length or weight to lop of a head. But, jabbed into a temple, eye, or throat, this little knife would probably do the trick. It's definitely sharp enough and pointy enough to do some real damage or kill an assailant. Ergonomically, the knife has a grippy handle that I can get three fingers around. It also has a guard to help prevent the users hand from slipping down onto the blade during combat. If you are using a knife this small against a zombie, it is way too close for comfort. This is for use in those desperate last moments with a zombie is trying to chomp down on you. But, it is small and quick to deploy. This knife is definitely a last ditch weapon. But, it looks cool and it is very affordable. Overall, I'd give it five stars based on the value delivered for the money.